Hepatitis C is a disease that mostly affects people after 40 years of age. Being an asymptomatic disease, Hepatitis C virus (HCV) can be hiding in the liver for more than a decade without apparent effects. This gives us an indication about when Hepatitis C patients were infected - not in older age, but in many cases before the age of 30 via the use of illicit injectable drugs. According to this next graph, we shall see why we have to be concerned about raising Hepatitis C awareness and informing our youth about the danger they may face later on in life. If we look at the 'All other age groups' curve, we see that the rate of people newly infected with Hepatitis C is steadily dropping from 0.18% of the population to 0.12%. The disconcerting curve is the second curve. 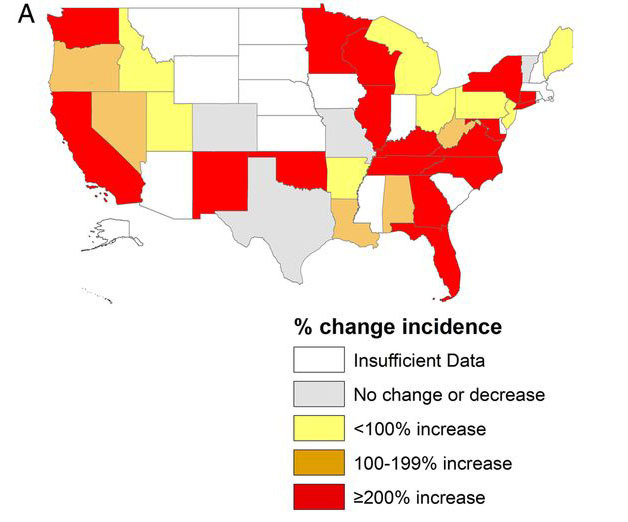 We see that the incidence of Hepatitis C patients in the US state of Massachusetts rose for almost 100% in 7 years. This indicated that there is a new wave of Hepatitis C patients on the horizon; the upside here is that by properly informing our youth about the dangers of injecting illegal drugs via needles - this is the most common way of Hepatitis C transmission - we can drastically decrease the incidence of new Hepatitis C patients. The survey data was gathered by Centers for Disease Control and Prevention​ for 34 states, and 634 people were interviewed about drug use. Looking at the CDCP data, one will find out that it's not Hepatitis C that is the issue - it is improper drug use. The most common transmission of Hepatitis from person to person is via sharing an injectable needle. With more than 50% of Hepatitis C patients being infected in such a way, it is a major source of recovery if we tap into it in the right way. Namely, if we remove the infected needles out of equation, Hepatitis C spread can be stopped very effectively. However, the problem is that more and more young people are using injectable drugs. This issue is being addressed for many decades now but the results, as we clearly see from the numbers of people still injecting themselves with opioids, are disconcerning . While stopping drug use is a very important cause, it is not necessarily needed to stop the spread of Hepatitis C.
Hepatitis C is something drug users may not be concerned about at first because it's effects will show only after 10 years or more. Nonetheless, the core of the problem with Hepatitis C are 'infected needles'. These are needles that were used by a Hepatitis C positive person at first but were later used by a Hepatitis C negative person without prior sterilization - in such a way, we get two patients from one patient, and the chain reaction continues. One way to break the chain reaction that is currently happening in the US is to provide clean needles. Many do see it as a kind of an incentive that even promotes drug use, but with regard to Hepatitis C, the solution, if implemented correctly, was of much benefit. There are no chances people will get infected if they use clean needles. Another solution is to 'tag' Hepatitis C patients, similarly to HIV positive patients. However, this approach is met with ethical dilemmas and even if it were implemented thoroughly would not yield as effective results as complete stop of drug use. According to demography of the US, there are more than 40 million American aged between 15 and 24 years old. As we have seen from graph above, the incidence between 2002 and 2009 rose from about 0.06% to 0.012%. How many more young Americans are suffering from Hepatitis C? If you do the maths, you see that there are more than 20.000 additional cases of future chronic Hepatitis C patients, just due of the new increase. Considering the high costs of treatment (for example Harvoni, most prominent Hepatitis C medication, costs $94,500 for standard treatment in the US), these additional cases alone will cost more $1 billion to treat. Now this is a subsancial figure that can make you think twice before injecting yourself with a non-sterilized needle.